This forum will give us an idea of what some of our young people are experiencing and how we as a community can help to understand and support them better through their emotional journeys. 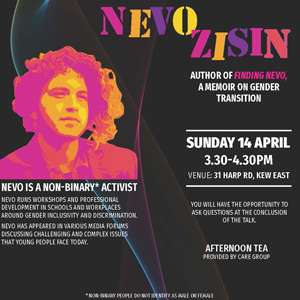 Guest Speaker Nevo Zisin is an activist who runs workshops around gender inclusivity and bias. Afternoon tea provided. A small note donation is invited.